All you have to do is open a door or window to hear the soothing sounds of Fightingtown Creek. Located just 10 minutes from historic Downtown Blue Ridge Blue Ridge, Georgia and Mercier Orchards. Also an easy drive to area attractions like zip lining, white water rafting, horseback riding, bird watching, photography, and hiking. 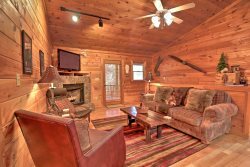 Creek Side Hideaway is a one of a kind cozy cabin that will be your go-to North Georgia Mountain retreat for years to come! No matter what the season, your drive to Creek Side Hideaway will set the mood for your getaway vacation as you traverse through the enchanting Cohutta Wilderness Area. Unbuckle your seatbelt as you pull into the easy-access gravel driveway and leave your worries at the door as you step inside. Creek Side Hideaway provides you and your special guest or guests a true, authentic cabin feel. Polished hardwood floors, inviting knotted pine and endearing decorations are sure to let you know you are in the North Georgia Mountains. Enjoy all the comforts of home with a completely updated kitchen featuring granite countertops, moveable breakfast island, modern stove, mounted microwave, dishwasher, dining for up to six, toaster, and coffee maker. Relax on the sectional couch while watching a Blu Ray movie on the 32-inch flat panel TV, or enjoy the outdoor access just steps away. Your sleeping accommodations are as impressive as everything in your open dining/kitchen area. Master bedroom features a new custom log king size bed, a custom wood dresser, and a 26-inch flat screen TV. Make sure to curl up with a book in bed and read by natural light provided by the glass skylight above. The master bathroom is connected to the master bedroom and features updated double vanity, walk-in shower and toilet. Much like the master bedroom, your guest bedroom features the same decorations found throughout your cabin, with Queen size bed, custom dresser and nightstand. Your guest bathroom is just off the main hall, featuring shower/bath combination, updated single vanity, and toilet. Outdoor living at Creek Side Hideaway is where this property really shines – you’re literally just a few feet from Fightingtown Creek! Step outside on the covered porch, breathe in the fresh air and take in your very own creek side oasis featuring a fire pit, rocking chairs, fruit trees, stone walkways, and stairs leading to the crystal-clear creek. Refreshment never felt so good! Guests that are staying during the fruit picking season are invited to pluck apples, peaches, and blueberries during the summer and fall months. Sit out back in a rocking chair or lounge in the two-person spa and watch the rich variety of north Georgia birds at the feeder or an occasional deer grazing in the meadow. Whether you’re looking for a romantic getaway, a North Georgia Mountain hideaway, or a home base for your adventures in Blue Ridge, Creek Side Hideaway will exceed your expectations. They were great,very patient with me because I flipped from a larger cabin fir a full crew to just me and my wife. It was just what we needed. For me I was looking for a good night rest for work the next day but wanted a place for my wife to hang out and have a nice setting for relaxing and reading. Mission accomplished!! Excellent experience from beginning to end. Very awesome Everyone was wonderful, friendly and the cabin was fantastic at Southern Comfort Rentals. Excellent Would love to make a return trip and make it an annual vacation and will let everyone know how wonderful it is in Blue Ridge with the hospitality of the Southern Comfort Staff. Sophia has always taken great care of us! We had the best vacation and cant wait k come back . Staff is very friendly!! Weve stayed at the same property twice and each time the staff was just as great as the time before! Love the cabin! Weve stayed for our anniversary twice! It has a cozy feel....kind of like home away from home. On our second trip there somehow our passcode to the door got changed. We had to travel down hill to get phone service and call the office. They handled it quick and we were back in at ur cabin in no time! We dealt with Kim to set up the rental and Jerry when we checked in. Both were EXCEPTIONAL!!!!! And the follow-up phone call from SCCR to make sure we were ok with the rental has never happened before in dealing with other rental firms. NICE TOUCH!! Southern Comfort Cabin Rentals is far and above any of the vacation companies we have dealt with in the past. They are an 11 on a scale of 1 to 10!!!!!! Very nice people and cabin . We loved the creek and fire pit! This property was EXCELLENT!!! I am very alert to cleanliness. This property was the cleanest that I have ever seen. I know it relates to the cleaning crew.I, myself, clean for 3 hunting lodges. I am also a RN and know the importance of cleanliness. I also know the importance of leaving a place as clean as it was found. I know that we left it as close as it was when we arrived. Thanks so much for your cleaning crew!!! They are awesome. This place was beautiful and we will return!!!! Everyone was so welcoming and friendly. Knowledgeable of the area and offered recommendations which I love. Property was everything we wanted. Two minor thing were to have a couple better pans as they are warped and to get new pillows as they are going flat. Cant wait to come back. They were very helpful and very friendly. Just enjoyed it so much, so cozy and clean will definitely will return again soon. Pleasant and prompt response to questions I had. Your team was excellent at each contact. We enjoyed our stay very much and are looking forward to coming again. It was wonderful! Will definitely do it again. Everything about Southern Comfort cabins was great. We arrived into town early so stopped by the office first. Our cabin was ready to let us go ahead and check in. We couldn't figure out the TV. With one quick call to the office, able to figure out the problem over the phone. They even called to check on us the next day. The cabin was equipped with everything you would need from the kitchen area to a few board games to play! We loved having Wifi on vaca to FaceTime with our son at night. We really enjoyed our experience at the Creekside Hideaway cabin. The staff was friendly & extremely helpful. The property was absolutely amazing and exactly like the photos! The location was close enough to town & easy to find. We enjoyed the hot tub. The property was well maintained. We were lucky enough to have a dusting of snow on our trip... for us Florida folks that's a pretty big deal! We will definitely be back either to this cabin or another! Thank you! The sweet lady at check in was absolutely great. We even got to get to our cabin early. Not sure everyone will have that happen but we did. She knew the area very well and the directions to the cabin were spot on. Haha you have to pass Walmart to get there. Perfect location. Our little trip was perfect. We celebrated our 11th anniversary. My wife and I were thrilled with the cabin. The hot tub on those cold nights was awesome and playing the board games by the fireplace in the living room was perfect. Glad y'all had those in there. We grilled steaks on the grill and ate while listening to the creek flow. What a three day mini vacation. Ready to go back and I just got home. We booked this cabin at the last minute. The staff was so helpful in locating something for us. All of my calls to the office were answered with professional courtesy. We even received a call after checking in to see if all was well. Checking in and out is so easy. We had no problems with our cabin. It was very clean and comfortable. Loved the towels and comfortable sheets. The information sheets are very detailed and helpful. This is our fourth time with Southern Comfort. We have been pleased every time. I would recommend this agency to our friends. Absolutely loved this cabin. Close to town, easy drive to get there. Cabin was spacious and comfortable. Loved sitting on the porch overlooking the creek and our dog loved the yard where she could walk and play. Looking forward to coming back! !